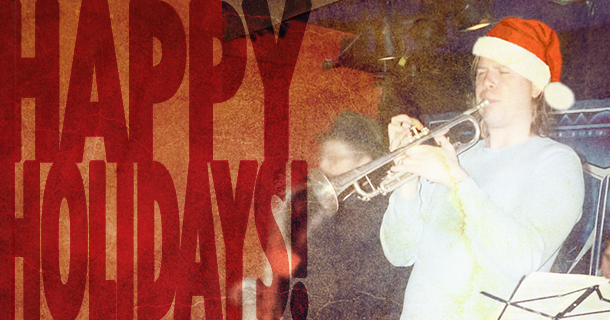 We just wanted to take a quick moment to wish you all the Happiest of Holidays! Have a great time and please be safe out there! We’ll be back in a week or so for a final recap of 2016 and Jeff’s year-long 50th Celebration, but in the meantime, we’d like to leave you with some more deets and reactions to ‘Holding On: A Heal My Soul Companion’. Now available worldwide! Be good folks! See you real soon! Compiled by the Jeff Healey Estate, the album features five rare Healey studio tracks that were all recorded during the same time period as ‘Heal My Soul’ (‘96-’98) and a concert recorded in 1999 – a live snapshot of a brilliant performer at the top of his game. With liner notes once again by yours truly and a number of fantastic, previously unpublished photos, ‘Holding On’ is a must have for any fan. It’s the perfect bookend to critically acclaimed ‘lost’ Jeff Healey album, ‘Heal My Soul’ and 2016 in general, a year which saw an incredible continuous celebration of what would have been Jeff’s 50th birthday. Released at the beginning of December worldwide, courtesy once again of our dear friends at Convexe Entertainment and Mascot/Provogue, the album is getting great reviews!